This has been a simply amazing year for cars. From hybrid supercars to track day weapons disguised as big Camaros, there's a little something for everyone. Here are the cars that topped our reviews in 2014. The top of the list is covered by two hybrid supercars, while American muscle comes in at number three. Porsche is the marque with the most cars on the list, with four, while fun American performance is found in two very different flavors from Chevy's Z/28 and Ford's Fiesta ST. Subaru is also well represented, with both flavors of the latest generation of its rally bred sedan making the cut. You can see all the cars that we've reviewed here. There are two types of premium compact super sports sedans: The BMW M3 is one type, the BMW M3-fighter is the other. The 2015 BMW M3 enters a more crowded ring of contenders than ever before. Is it still the top of the heap, or does it finally need to concede to its rivals? You throw the 2015 Subaru WRX STI into a corner. In days of yore, the front end wouldn't bite and you'd start to wash wide. Subaru had developed the recipe for understeer. But this new STI... It bites. It turns in. This is a Porsche 911 fighter for a third of the price. Oh, and one of the best new cars you can buy today. Now that it's all-new and has a fancy sedan body, Americans are going crazy for the Audi A3. But that's not the best part of the car: that would be the fact that the hotted-up Audi S3 version is finally for sale on our shores. Now is it damn good, or is it a sports sedan poseur? Let's find out. "Remember that car? That sure was a great car. I really wish they still made that car today, because I'd totally buy one." That's a conversation that happens multiple times a day in theJalopnik comments. Let me tell you this: years from now, the Ford Fiesta ST will be the subject of that conversation too. You're always told to not judge someone by how they look. They might look anonymous, but they might also be caring, hilarious, or just plain fun when you talk to them. 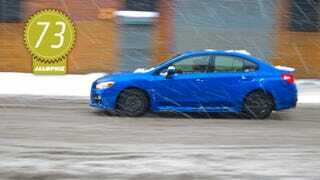 The 2015 Subaru WRX is Droopy Dog from the outside, but Usain Bolt and Jerry Seinfeld under the skin. This is a car you have to know. Giblets aren't the most delicious part of a meal, but Maserati has decided that they need to compete in the Thanksgiving meal market. Oh, I've just been told this is a car and it's called a Ghibli, not a Giblets. It also sounds like a Norseman gargling hammers. It's also delightfully frustrating. Some people believe Porsche should offer one car and you get to choose the color. Porsche, well, they don't think that way. And even though the Panamera isn't much of a looker, it's a hell of a driver. *An earlier version of this list included the Camaro SS 1LE, but I missed the Fiesta ST when putting the list together. So, sorry Chevy, you've been deleted. Whoops.